Train in style with the new Arsenal Men's 18/19 sleeveless training shirt. 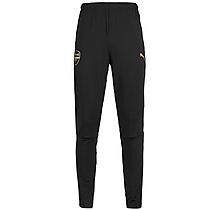 Offered in red with gold detail including the club crest, Puma logo and Fly Emirates sponsor name. The shirt is made with breathable dryCELL technology which helps draw moisture away from the body allowing for more comfort during exercise. The asymmetric hem offers unrestricted movement during exercise.